Perfectly designed for low cost, high performance, and easy installation, PLANET FNSW-4800, a 48-port 10/100Base-TX Fast Ethernet Switch, is your best choice of switched networks. 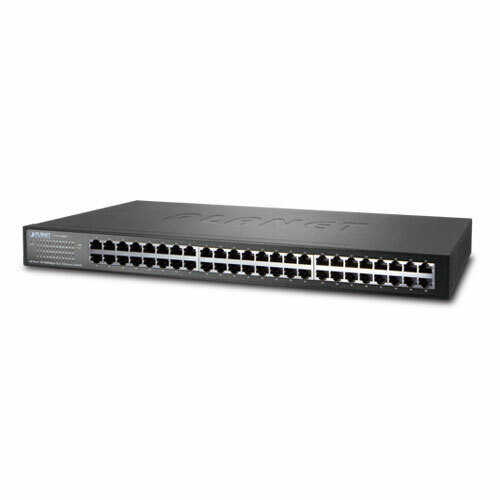 PLANET FNSW-4800 is a 48-port 10/100Mbps Fast Ethernet Switch with 19-inch 1U rack-mount size. It is ideal for businesses, the network edge, or workgroups within large organizations where an extra bandwidth is required. The FNSW-4800 is capable of providing non-blocking switch fabric and wire-speed throughput as high as 9.6Gbps to perform effective data traffic control for VoIP, video streaming and multicast applications in SMBs and enterprises, thus greatly simplifying the tasks of upgrading the LAN for catering to increasing bandwidth demands. The high-performance throughput at filtering / forwarding rate is up to 14880 packets per second in 10Mbps, and 148800 packets per second in 100Mbps. Along with its dynamic shared memory buffer, the FNSW-4800 can boost bandwidth, eliminate unnecessary traffic and relieve congestion on your critical server path. The FNSW-4800 is the ideal option to alleviate bottlenecks in client / server and peer-to-peer environments in a cost effective way. The FNSW-4800 provides a combination of 48 Fast Ethernet Switching ports that provide users with high-speed network connections. With its auto-negotiation capability, all the RJ-45/STP ports of the FNSW-4800 can be configured to speeds of 10/20Mbps or 100/200Mbps automatically. In addition, the product is equipped with the MDI/MDI-X auto detection for easy plug and play connection, regardless of cabling types – straight-through or crossover. The FNSW-4800 successfully reduces substantial power consumption with the fanless and noiseless design collocating with the effective cooler. Therefore, the FNSW-4800 is able to operate stably and quietly in any environment without affecting its performance. With up to 9.6Gbps switching fabric, the FNSW-4800 can easily perform as the high bandwidth Fast Ethernet network backbone or your workgroup’s backbone. The FNSW-4800 can uplink directly using any straight or crossover cable to the backbone switch providing the connectivity to back plane yet segments the network traffic of the department to your backbone. 2014-02-06 3.0 Release for hardware version 3.0.